New Winter 2018: Here’s a personalized friends ornament affordable enough to have one made up for you and your BFF or daughter and her closest friend. The besties forever, both blond girls ornament personalized from Russell Rhodes includes their custom details, but a lettering artist paints them on by hand using an attractive font. The result is a girls friends ornament personalized to be a hit now and sentimental favorite as the girls stay close. This personalized friends ornament includes our exclusive velvet gift and storage pouch. 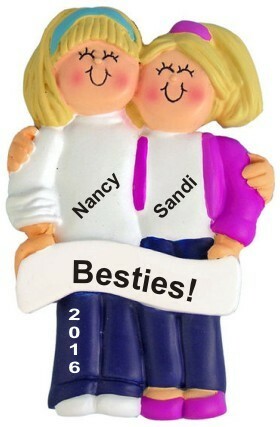 Share the love this holiday season with the blond girls best friends ornament personalized for a pair.